Just when we thought the heyday of pristine barn finds had all but dried up, cars like this one bubble to the surface. Back in 1978, Chevrolet celebrated the 25th anniversary of the Corvette by pacing the Indianapolis 500 and releasing a handful of special-edition pace car replicas to the public. Just 6,502 of the black and silver Corvette models were ever produced, and the vehicles sold out quickly. 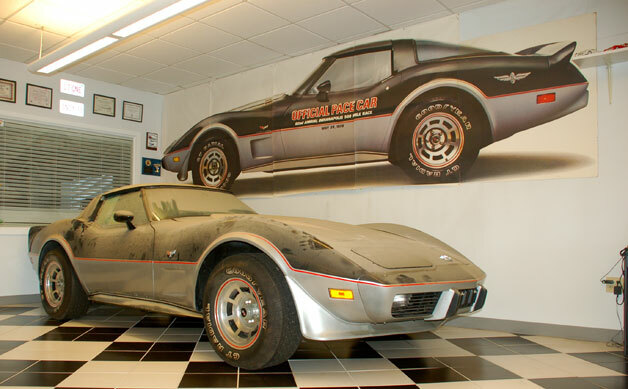 Sensing a potential future collectible, the original owner of this 1978 Chevrolet Corvette pace car bought the car and tucked it away in his garage. In 1995, the owner sold his house and had the Corvette pace car transferred to a Detroit-area storage facility, where it was locked away for good under a pile of boxes. Now the car is being offered for sale through Corvette Mike New England. According to the site, the original tires still hold air, and surprisingly enough, the engine still runs. We had to wince a little when we heard that the seller decided to run the original half-tank of gasoline through the engine. Dropping the fuel tank and draining the system surely couldn't have been that hard. Head over to Corvette Mike New England to see a full gallery of the car and click past the jump for quick walk-around video. There's no word on exactly how much this macho '70s machine will set you back, but we're guessing it won't be cheap. Wow what a find! I have been to Corvette Mike's and its an awesome place to walkaround the salespeople dont even bother you since there use to people just walking around. If your wondering why the car does not have the indy stickers on it. GM would ship the car (any pacecar) with the stickers in a box and the customer could decide weather to put the stickers on or not. The box of stickers are shown in the video. I would think the box of unopened stickers would add even $$$ more to the car value.